It's that time of year again, when I am able to confirm the details of Charlesworth & Chisworth Cricket Club's 3rd Annual Chairman's Evening. 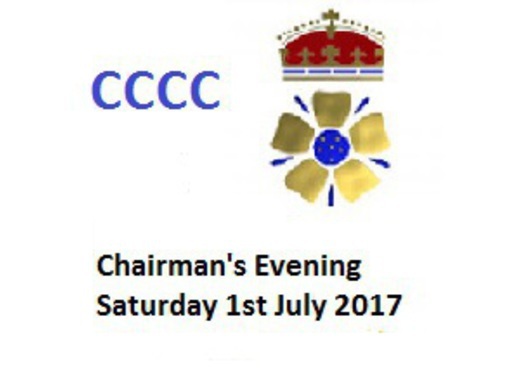 It is to be held at the club pavilion on Saturday 1st July 2017 (7-7.30pm start). As in previous years the price of entry will include either a traditional Meat and Potato Pie or an exotic curry made with the finest of oriental spices. The cost of the ticket will be £7.00 per person and this year, I am delighted to announce that we have for the evenings' entertainment, the extremely talented " Flying Rasputins" who many of you will have seen and enjoyed. Tickets will be made available very shortly and will be used for admission and to obtain the food on the night. It is an opportunity for the club to thank the sponsors and this year we have great pleasure in welcoming the Lord Mayor and Mayoress of Glossop as our special guests. For those who love that fine traditional ale, I am pleased to advise you that we shall have on draught that finest of Ales, namely Marstons Pedigree. I look forward to welcoming as many of you as possible and for club players and members, I would welcome any prizes to be donated for the night's raffle.